1 ─ I forgot my password to connect to the Extranet. What should I do? 2 ─ I am not sure if I have paid my EPA membership fees. How can I check? Please verify if you are up-to-date in payments; go on your Extranet account on the tab “My Account”, then click on “Membership Fee”. You will see the last payment you made. 3 ─ I want to pay my EPA membership fees. How can I pay? You are kindly invited to log in to your Extranet account. Go on the tab “My Account”, then click on “Membership Fee”. You will see a button “pay fee online” below; click this button and you will then be redirected to a secure online payment system. Or you can pay via bank transfer. If you wish to use this option, please contact the EPA Office at: epa.membership@europsy.net for specific information. 4 ─ It is possible to receive an invoice/receipt/certificate after the payment? On your Extranet account, on the tab “My account” then “Membership Fee”, you will be able to download/print directly the EPA Invoice and/or Receipt, following your payment. Please select the year concerned, and then choose the file needed. On the tab “My account” then “Membership Fee”, you will be able to download/print directly the EPA Certificate only if you are up-to-date with payments. 5 ─ If I pay my EPA fees today, when will my membership start? EPA Membership and all benefits run from January to December for each year. 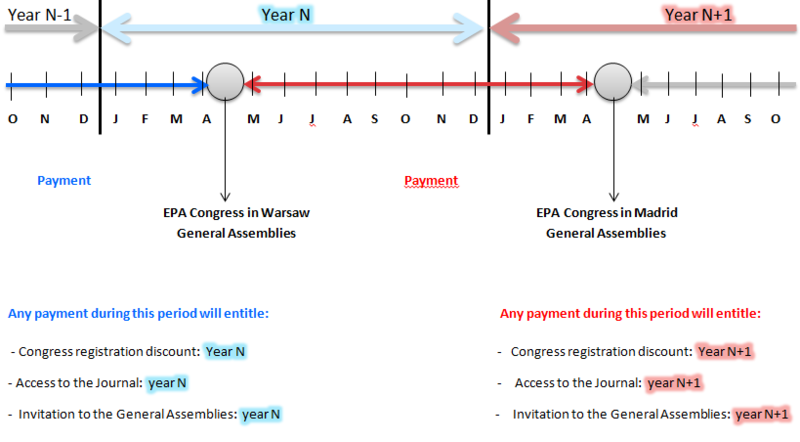 EPA fees payments go from General Assembly to General Assembly. Please contact the EPA Office if you need further assistance. 6 ─ I applied to become an EPA member today. When will my application be reviewed? We really care about our members/future members, and your application will be reviewed within 5 working days, during EPA Office working hours: 9:00 am to 5:00 pm (CET) from Monday to Friday. 7 ─ I am an EPA member but I did not pay my fees for the current year yet. Can I still benefit from the reduced Congress registration fees? You have to be a paid-up EPA member to register as an EPA Member for the Congress. As long as you pay your fees before the Congress, you can still benefit from the reduced registration fees. For information on how to pay the EPA membership fees, please see question n°3. 8 ─ I have paid my EPA fees today and I want to register to the Congress, but the system does not allow me to do it as an EPA member. What should I do? Due to logistical reasons, please allow a couple of days between your EPA membership payment and the possibility to register as an EPA member to the Congress. 9 ─ How can I have online access to the European Psychiatry Journal? Step 2: Once after successful login, you will be able to see “Claim subscription” at the top right corner. Click on that. Click on “Activate Claim” and your subscription will be successfully claimed. Your question is not on this list? Please contact us at: epa.membership@europsy.net; we will be very happy to help you during EPA Office working hours: 9:00 am to 5:00 pm (CET) from Monday to Friday.